JACKSONVILLE – The honors continue for Calais Campbell. And on Wednesday, the Jaguars’ veteran defensive end received one of the biggest possible. 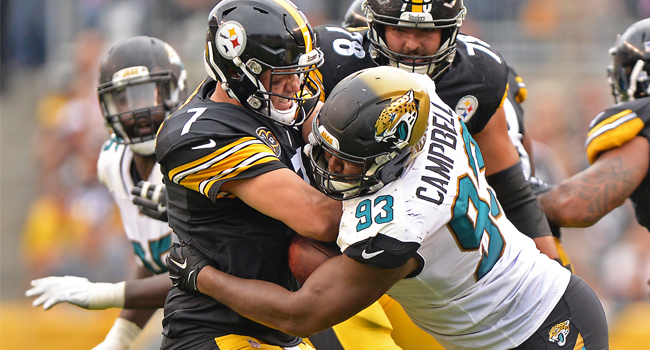 Campbell, who led the AFC in sacks in his first Jaguars season this past year, on Wednesday was named the 2017 Defensive Player of the Year by the Pro Football Writers Association. “It’s a true honor to get any kind of accolade, especially one that’s as prestigious as that,” Campbell said Wednesday as the AFC South Champion Jaguars (12-6) prepared to play the AFC East Champion New England Patriots (14-3) in the AFC Championship Game at Gillette Stadium in Foxboro, Massachusetts, Sunday at 3:05 p.m.
Campbell, who signed with the Jaguars as an unrestricted free agent from the Arizona Cardinals in March, became the first player in Jaguars history to be named Defensive Player of the Year by the PFWA. Campbell, who registered a career-high and franchise record 14.5 sacks this past season, has been named a Pro Bowl starter at defensive end, an Associated Press first-team All-Pro at the edge position, a PFWA All-Pro and the NFL 101 AFC Defensive Player of the Year. Campbell also was named second-team All-Pro as a defensive interior player. Campbell registered 67 tackles with 14 tackles for loss, three forced fumbles, three passes defensed and a fumble recovery. He returned the fumble 10 yards for a touchdown against the Cardinals. Campbell also set a franchise record with four sacks in the regular-season opener against Houston, the most in a game in franchise history and the most in a game by an AFC player this season.